Summary: After successfully negotiating a difficult route in foggy conditions with map and new sighting compass on a recent walk in the Peak District I decided to hone my new skills by taking a walk that would include some open moor crossing where there are no paths. Not too difficult a walk on my first solo outing but one that needed accuracy all the same. 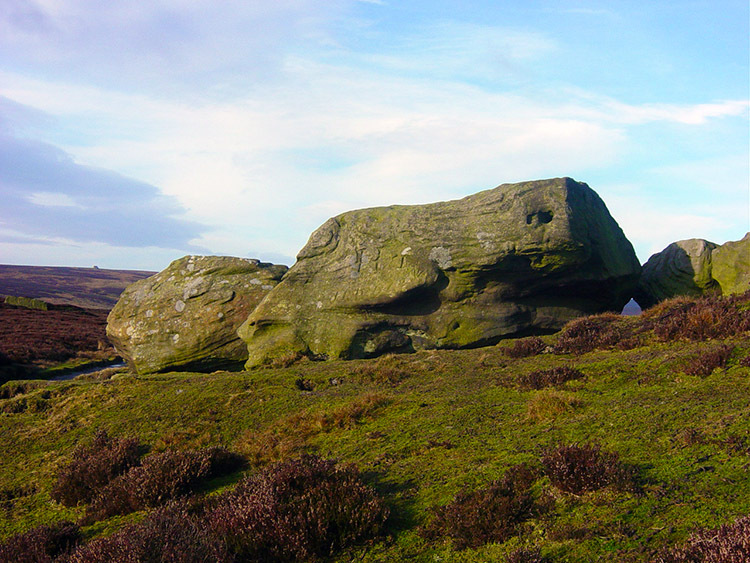 And so after scanning the OS Wharfedale and Washburn Valley map I decided to link two walks from A David Leather's excellent 'Walkers Guide to Mid-Wharfedale & Washburn Valley'. 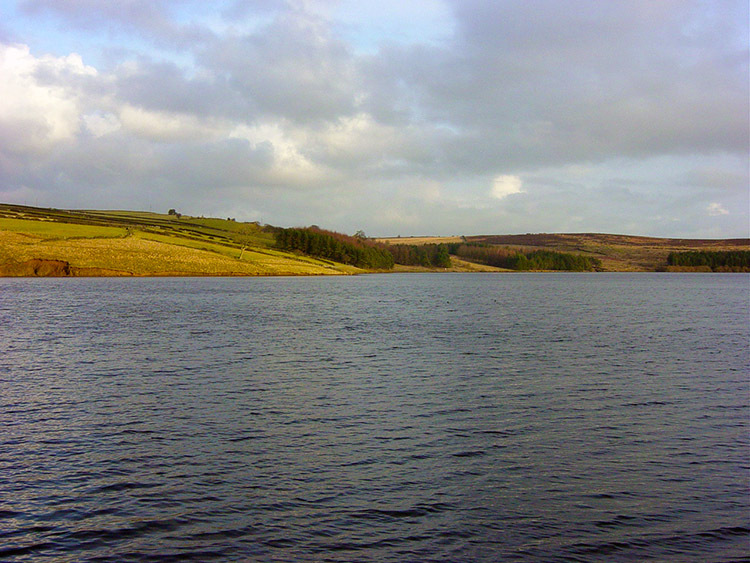 My hybrid would take me from Thruscross Reservoir to Rocking Hall, part of his walk 9 and then I would cross over unpathed open moor to the source of the Leeds Washburn Valley reservoir system at Capelshaw Beck via Bramley Head (walk 10) before walking along the south-western bank of the reservoir past the sunken ruins of West End village and back to the car park. Note: 1) The route and downloads are for the permissive route and not the route described in the report. 2) I have been informed that dogs are not allowed on parts of this walk within the Duke of Devonshire's estate. Please check before doing the walk. The walk begins in the generous car park supplied by Yorkshire Water. There are plenty of spaces provided and there should be no problem finding a space except on the busiest of summer days. 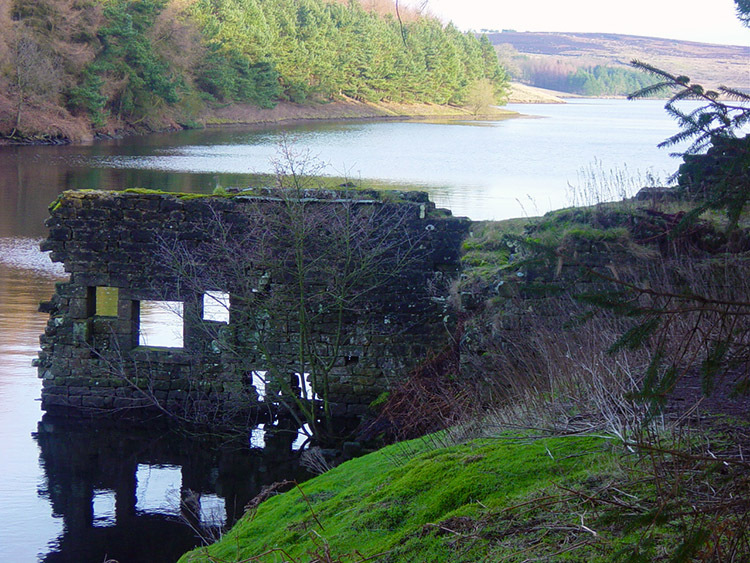 Begin the walk by finding the Washburn Valley path that leads down to the outflow side of the dam wall. 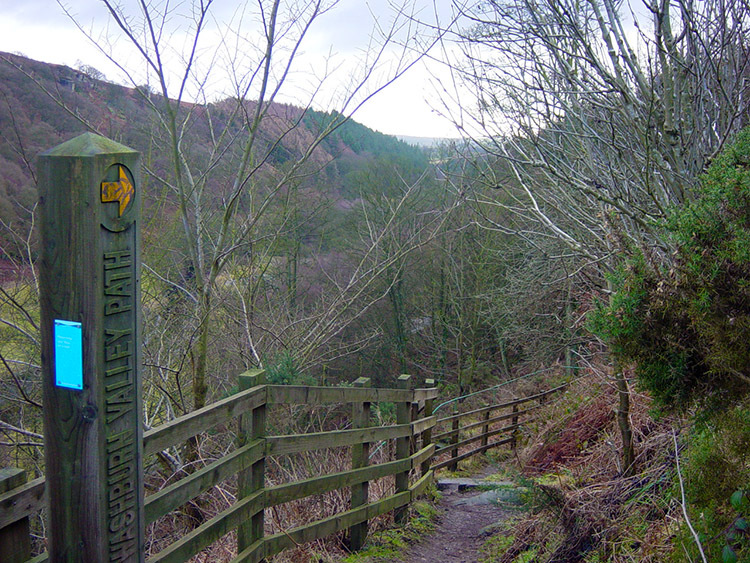 Walk down this picturesque valley for about half a mile until you reach a footpath sign that takes you steeply up the bank to your right. 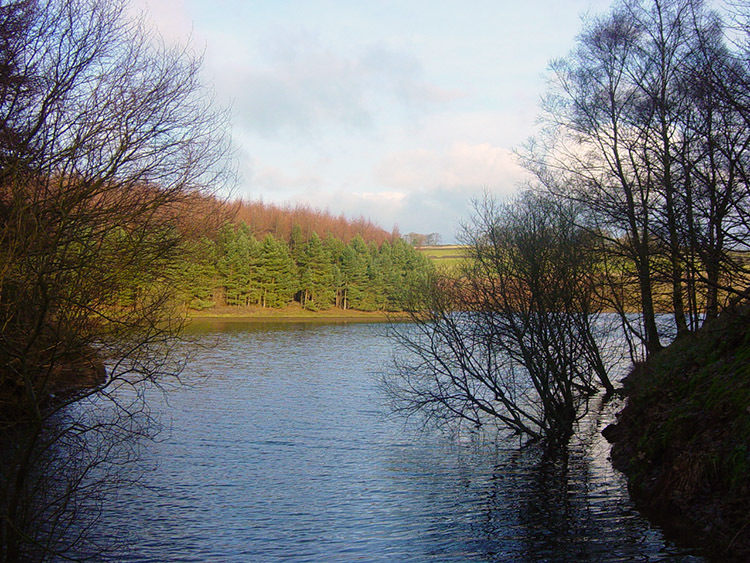 After climbing a stiff 40 metres cross a road and make your way along a walled bridleway to Redshaw Hall. This bridleway was waterlogged when I did the walk so expect to get your boots wet! After Redshaw Hall the bridleway is left behind. Cross open fields in a westerly direction until you reach another road which is followed north-east until you pass Burnt Houses where you resume a westerly course along a good farm road to Spittle Ings House. 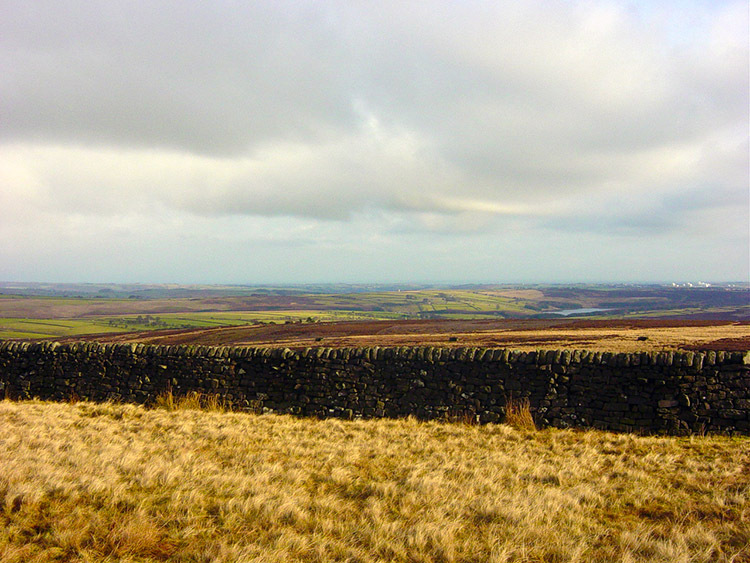 From here access open moor and once over the stile you can see the next target almost due west in the far distance. 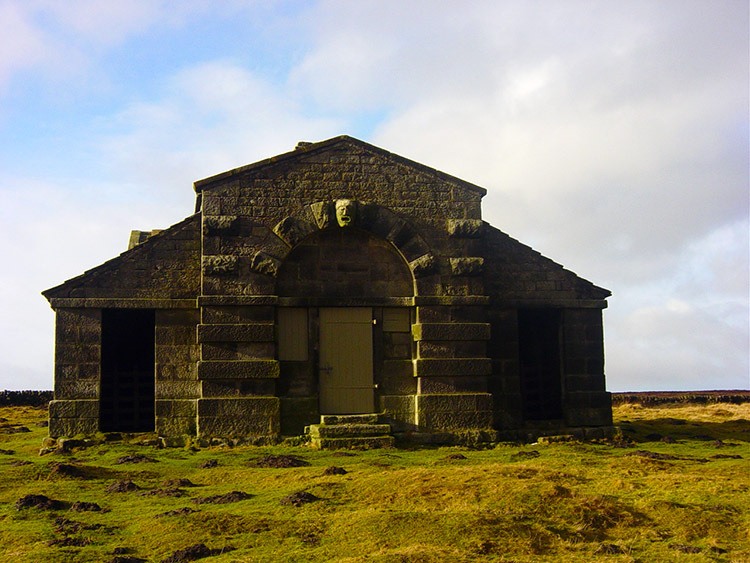 The building is Rocking Hall shooting hut standing on the open moor. The walk from Spittle Ings to Rocking Hall is delightful. 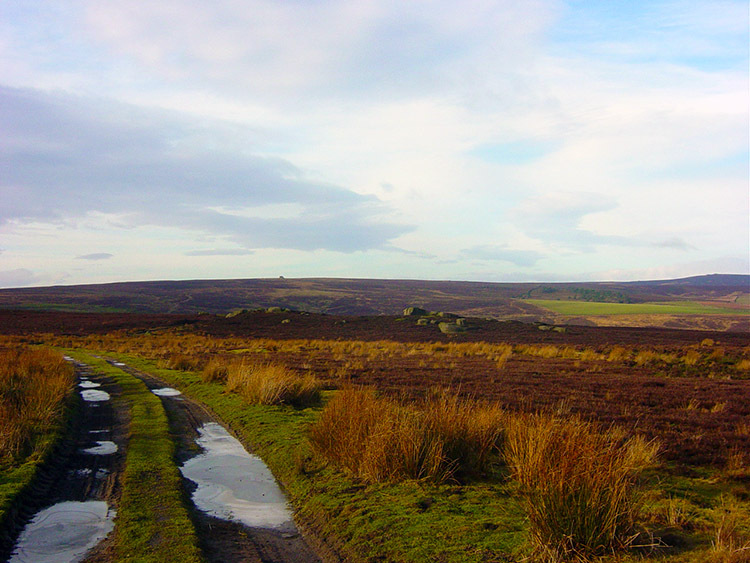 It is a mile and a half of great walking on wide open moor where your only company is likely to be a Golden Plover or the numerous grouse that make the moor such an attraction to the shooting fraternity. It's all gentle climbing too so the hut is viewed as a target for a well earned break. Rocking Hall provides sanctuary from the elements to for the hut has two openings either side of the locked main door which provide shelter rooms for walkers. How civilised I thought as I arrived just as a storm was beginning. 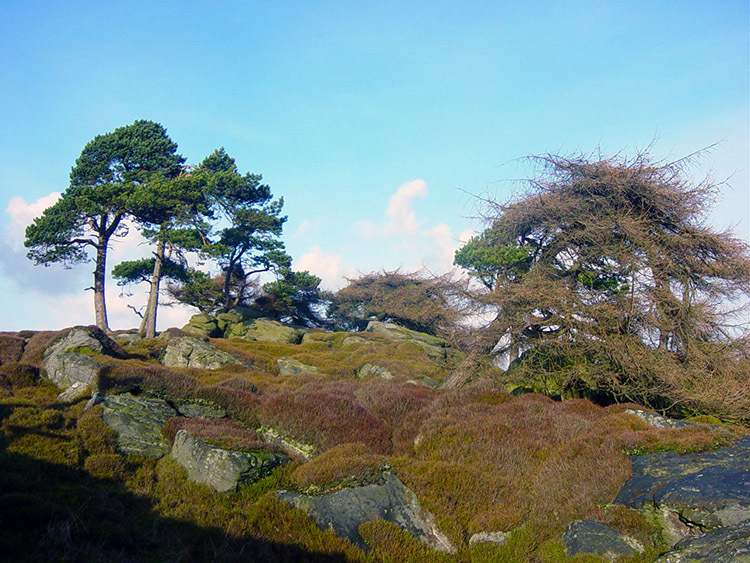 I duly sheltered in one of the walkers refuges and took lunch. Both refuges are very clean. Each has benches and coat hangers provided and each has a fireplace (no fuel though, so take your own) for walkers to dry out should they need to. Luckily for me the storm passed quickly for this was a good mid-January day. To ward off evil walkers? 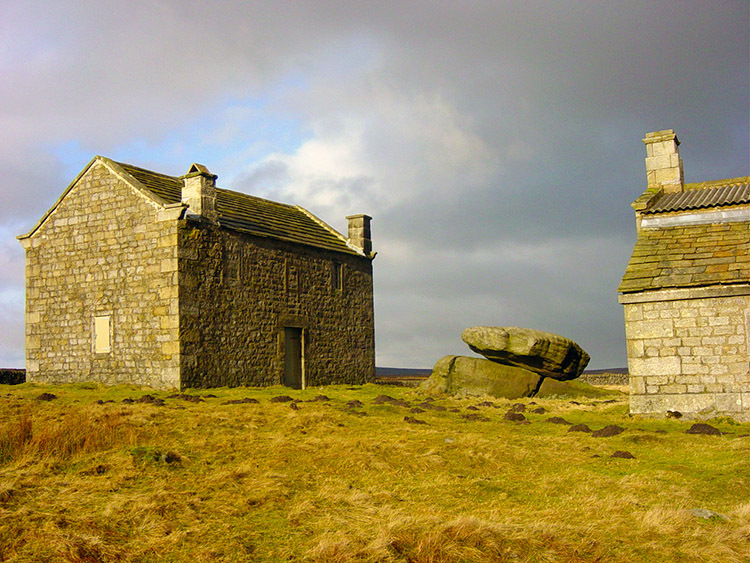 Another feature of Rocking Hall is the famous rocking stone stood between the main hut and a second building which reputedly last rocked over 150 years ago. 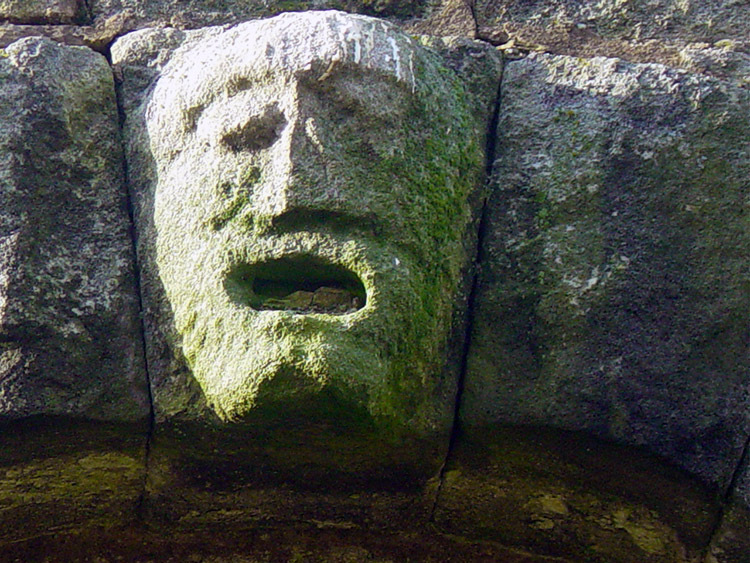 Then there is a grotesque stone carved face taking guard above the main door. 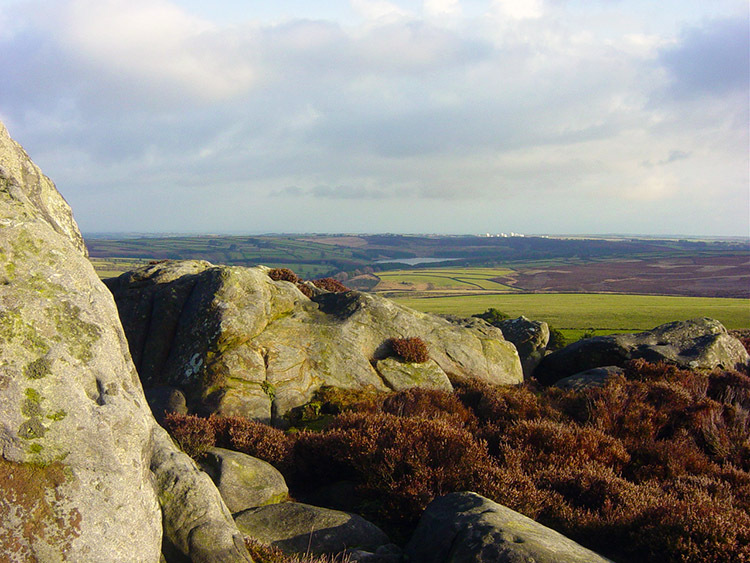 I enjoyed my break at Rocking Hall and soaked in some marvellous views including watching fleeting winter storms crossing over the moors and Thruscross Reservoir. I hoped they would be over and done with by the time I got back. Anyway I had other things on my mind now. I had to plot my route off the moor. My wife Lil had bought me a new Silva Ranger sighting compass for Christmas and I was determined to learn how to use it properly. After the recent mishap with Steve and Dave when we walked off a cloudy Ingleborough in completely the wrong direction I had determined to learn how to navigate properly and never go so wrong again. I am sure I will not get it right all the time but I resolved to be within a few degrees of where we should be, whatever the conditions. And I did read it correctly in fog in the Peaks. Omens were good. 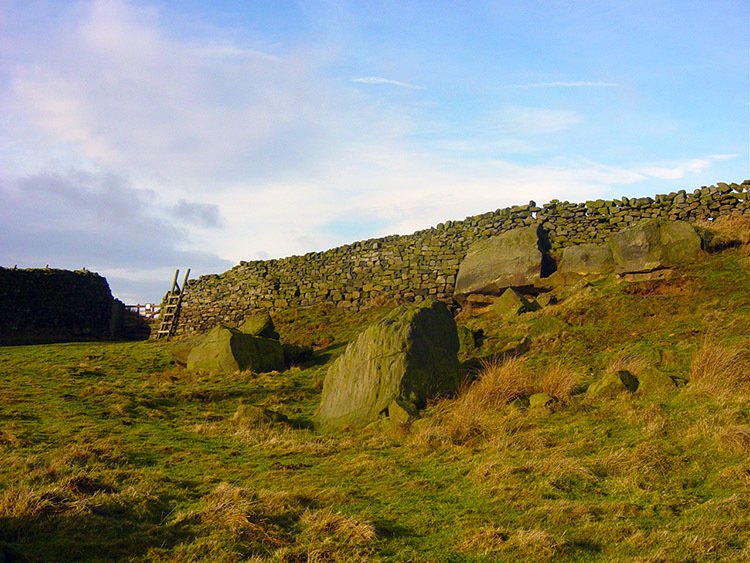 I had pre-plotted the route to go from Rocking Hall to the source of Capelshaw Beck via Even Stones and Raven Stones. They could not be seen from the hall so I took a map bearing and set off. After about 600 metres I walked onto Even Stones. I was spot on and was so chuffed because I had even used the magnetic variation calculation. Raven Stones was not so difficult as I could now see them but again I repeated the calculation and the direction was correct. 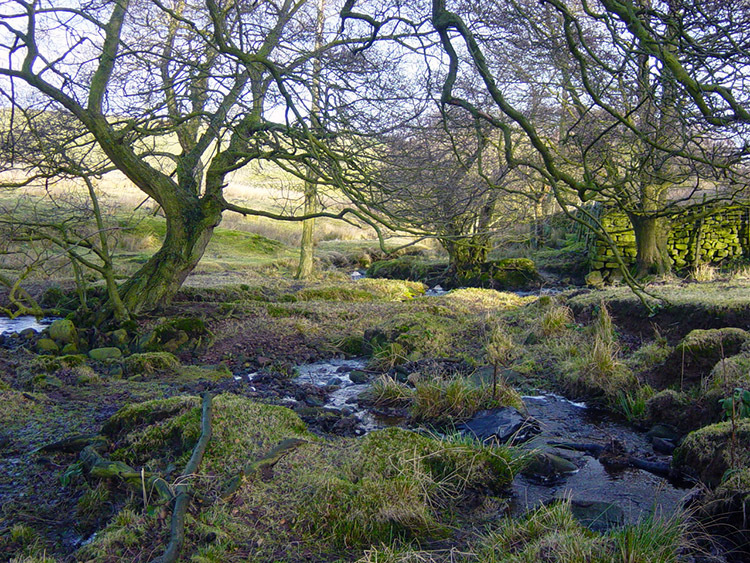 I reached Raven Stones and made my way down to Raven Stones Plantation from where I followed a wall down to the source of Capelshaw Beck that flows all the way to Thruscross Reservoir. The beauty of being able to navigate successfully and do this short stretch is that seldom few others have done it. There were no footmarks to be seen anywhere. It was a fantastic feeling. 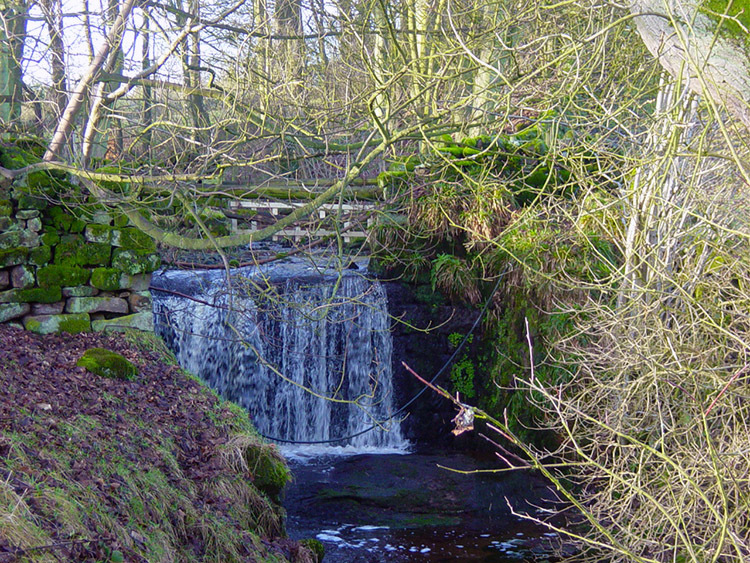 After reaching the beck it was an easy job following it past the numerous farmsteads of Bramley Head and onwards to the reservoir itself. Walking alongside the reservoir has an eerie feel to it. When the reservoir was first filled it took away a village. This sunken village, West End was a small community that had thrived during the nineteenth century when the textile industry was in it's heyday. It had a Post Office, a Methodist Chapel, Textile Mills and a warehouse. The village was happy before the new reservoir took its soul once and for all. When the reservoir is low you can still make out the layout of the village. When I went past during this walk I saw remains of only one building. 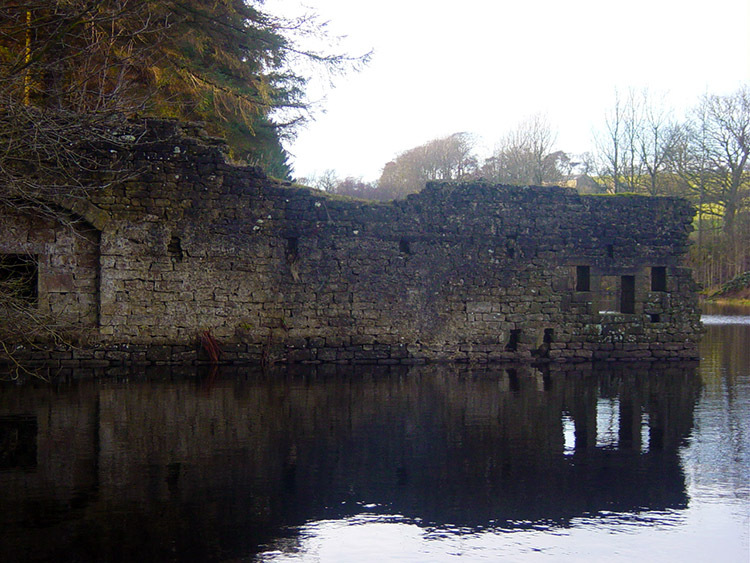 And so, after pausing near the derelict half submerged building I made my way alongside the reservoir back to the car. I had enjoyed the walk and practised my new navigating skills. I was well satisfied with my day out.